Dungarvan Shopping Centre is delighted to welcome the Festival of Food weekend to Dungarvan with an action-packed programme of events on the Plaza this Saturday from 1pm and Sunday from 11am. Over the weekend we have an action-packed Saturday & Sunday full of family fun and entertainment along with fine gourmet food and tasty treats for all the family young and old alike. Our magical carousel is back by popular demand which will keep the kids entertained while mum and dad and grandparents can enjoy a cappuccino and a tasty treat and hopefully bask in the glorious sunshine which has been the hallmark of the previous food festival weekends on the Plaza at Dungarvan Shopping Centre. 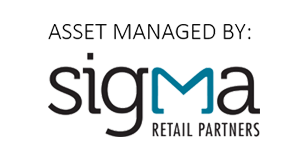 Dungarvan Shopping Centre would like to congratulate the Festival committee for putting together such a fantastic programme of events for the weekend and we are delighted to play our part in supporting the festival weekend. 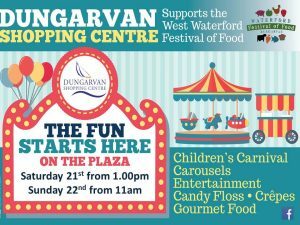 So remember to come along to the Plaza at Dungarvan Shopping Centre on Saturday from 1pm and Sunday from 11am and enjoy our Carousel, entertainment and make sure to try our gourmet burgers and hot dogs along with candy floss and the best tasting ice cream which is guaranteed to satisfy any palette. The West Waterford Festival of Food at Dungarvan Shopping Centre. DON’T MISS OUT…. DUNGARVAN SHOPPING CENTRE PUTTING THE FUN INTO FOOD! !